Walking by Sather Gate Monday afternoon, we happened to spot a rather eye-catching group of risqué-dressed singers. On closer examination we discovered they were none other than our coed a capella group Artists in Resonance, otherwise known as AIR . 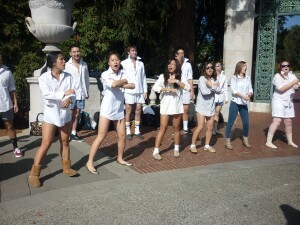 In the spirit of Halloween, they decided to make their themed Sproul performance one of Risky Business . After all, who doesn’t love Tom Cruise singing in his underwear? Take a whole set of singers in broad daylight and it becomes even better. Luckily for these copy-cats it was a sunny day; otherwise the white dress shirts and shorts wouldn’t have been all that fun to dance around in. Sunglasses looked better with their ensembles that way too. A few of the girls had jeans on instead of shorts, but the majority of AIR went all out in their imitation. Would you have the guts to sing in front of everyone on Sproul in your underwear? We’re not sure we would, so props to this group for pulling it off.